I'm Cari from KS. I'd say my most recent favorite book is Collins' Hunger Games. I'm definitely a Twizzlers person. I had no idea who or what Rafa was until I clicked the link, though I do pause on tennis from time to time when flipping channels. My thing that must go: the crap in the spare bedroom. I really, really need to sort it out and toss some stuff. I was 17 when I had my first kiss. Wait...or was I younger? No! I blocked it out! I was in 8th grade and it was this horrid slobbery attack. Eck. I think I slapped my dad in the face when I was a kid. That didn't go over well. Random thing: today is my birthday. Also, I'm a librarian working the night shift tonight! 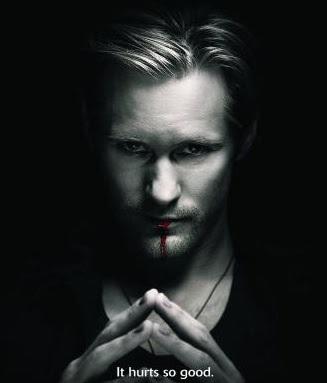 Being the metrosexual man that I am, I have no problem in admitting that David Boreanz (Angel) and Erik from True Blood are good looking men. We have heard nonstop stuff about Twilight, etc...but the 90s were vampire fabulous with Buffy the Vampire Slayer and Angel. 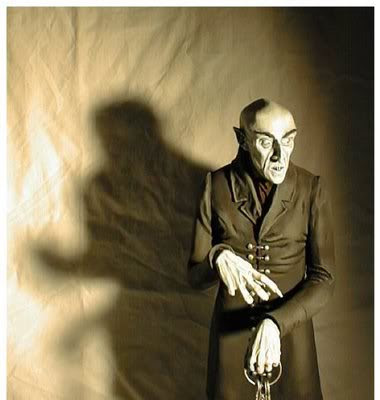 If people want to see some great vampire stuff, you need to go back a decade and check that stuff out. Long live Buffy and Angel. Cari- Welcome! Love the Hunger Games too. Can empathize with the slobbery kiss. Slapping your dad? I never wouldve survived. Thanks for saying hi! Sam- I have a craving for some Buffy reruns too. 4. Twizzlers or Red Vines? Either as long as they are red flavored. 5. Do you love Rafa as much as I do? *ducks head* never heard of him until this blog. 6. Thing that must go: cute shoes that you cannot wear for more than 3 minutes. Can't they make comfy AND cute shoes?!?! 7. Age of first kiss: 14 and it was awful! I'll spare you the story. 8. Have you ever slapped someone in the face? No. 9. Have you seen Jacob's abs? Yes and wow! I like your list but I think Keifer Sutherland from Lost Boys is missing. Also, for the Edward versus Bill, it should be Edward versus Eric but I'm biased. I will say the first season was WAY over the top, but by the end it seemed they may have toned down the *ahem* gratuitousness. I haven't bothered with the second season, I'm afraid to see if they have gone back to the evil HBO ways. Sorry so long, but I missed Friday's blog! transplanted to Arizona 9 months ago. book:101 famous poems~ t.v. i am so corny i love The Medium.. most people don't even know what it is! if your talking about tennis RAFA. isn't he beautiful. if your talking about RAFIA that straw ribbon stuff used in decorating.. not so much. sorry couldn't resist. the treadmill from my bedroom. i so wish i had. not so much a jacob fan..sorry. pulling up his pant is a good thing ..lol. i am in a blog slump so i have been writing useless trivia,news articles..etc. i need to keep my blog current or i think everyone will leave me. i am very insecure that way. 5. Do you love Rafa as much as I do? He's hot, but I'm not much of a tennis fan. I'm not much of any sports fan, though. 6. Thing that must go: Those vinyl family sign thingies on the back windshield of people's cars. 8. Have you ever slapped someone in the face? No, but I've always wanted to. I'm kind of a vampire novice. So, I don't have much variation from the list and, yes, Edward does make the top of the list for me. If we were strictly going with supernatural beings and not just vampires, Jace from the Mortal Instruments would definitely be on my list too. 4. Neither, those Australian one's. 10. Mu-ah? I'm always PG. You just have a filthy mind. Tsk. 10. I am a Twitter-addict. My fav. 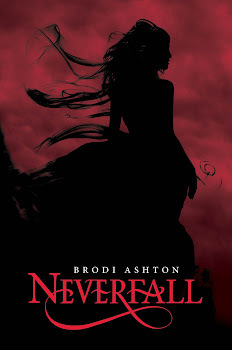 supernatural is Georgina from Richelle Mead's Succubus series. Una- Thanks for bringing Lost Boys into it. I loved loved that movie as a kid, although I was more in love with Jason Patric's vamp than Kiefer's. Oh, and give season 2 a try. It's like a whole new show. (I hear, from my friends who watch it). Gramee- welcome to the blog! We need a sophisticated person such as yourself (one who lists poems as their favorite book) around here. And I definitely mean tennis Rafa, not crafty Rafia (which I didn't even know existed until you mentioned it...) When you start blogging again, give us the link and we'll have a looksy. Cam- Thanks for putting the "13" in PG-13. 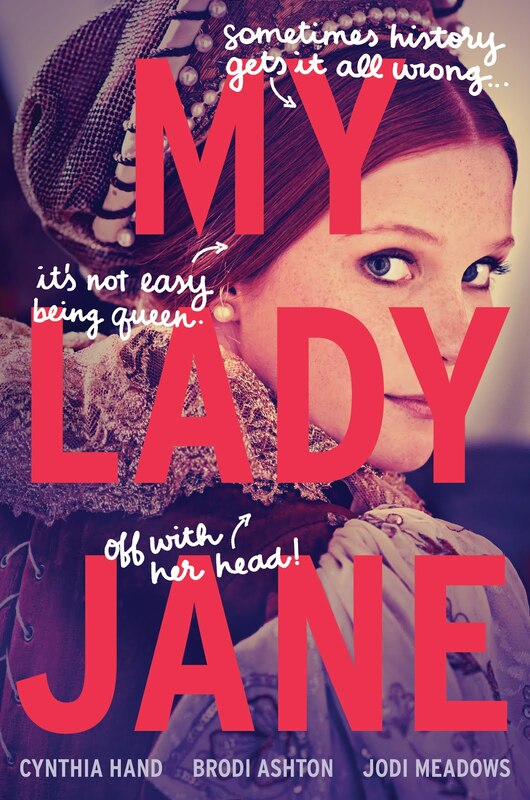 #5 gets you kicked off my blog, but #9 gets you back in, and up to blog royalty. Rob- Welcome, eh? (Sorry, that's the only Canadian phrase I know... except: Hockey. Eh?) Bet you wish you went back to lurking status right about now, correct? As for #6, if you learn the secret in this current econo-slime, let me know. And #9? Really? I thought they saved that for Edward's abs... oh well. Here's to a healthy suspension of reality. Ok, Brodi, given a choice between ONLY Twizzlers and Red Vines, I'd say it's a wash, because the only licorice truly worth celebrating is authentic black licorice. Please tell me that you at least sampled the pseudo-German little black licorice buttons that Grandpa Ashton always had around the house growing up! Ok, technically, they were from the candy counter at ZCMI, but they reminded Grandpa of the good German stuff from his mission, and he got me hooked! Seriously, I know my mom loved that black licorice too, but am I the only Ashton of our generation still carrying the torch? Say it ain't so. 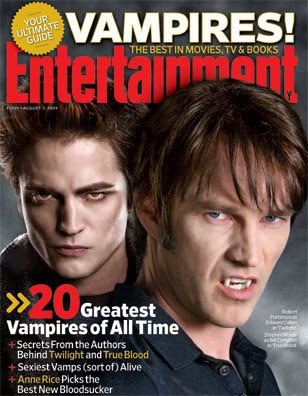 And no, I'm not going to pick a favorite vampire--I'll just remind myself that vampires are totally made-up and look forward to when you start blogging again about putting hair gel in your eyes. Maybe the secret to getting you published is for you to write your autobiography! I like red vines best. I LOVE Jacob's abs. I just think his pants need to come up about 2 inches. I know, I'm weird. Spike is my #1 vamp.Always will be. Amy- so instead of blogging about fictitious beings, you'd rather have me stick hair gel in my eye? Something is seriously messed up about that. And, no, Grandpa Ashton never shared the black licorice with me. He saved that for his favorite grandkids. Diana- welcome! I, too, love the Hunger Games, and I'm eagerly awaiting the sequel Catching Fire next month. And give Rafa a chance... you won't be disappointed. 3. Book: hmmm....don't have a favorite, but I love lots of them. Really liked "Hotel on the Corner of Bitter and Sweet." 5. Honey, NO ONE loves Rafa as much as you do! 8. I've slapped my kids on the mouth for spitting, does that count? Don't turn me in, it was more of a love tap. 9. Ah, Jacob..........what was the question? 10. My kitchen is about to implode from messiness. Guess I shouldn't be on the computer. Bree- I thought Daniel would top your list. I can't wait for everyone else to get that reference! Cousin K- I always loved the cover for "Hotel on the Corner of Bitter and Sweet." Maybe I'll have to pick up a copy. And you are not the only one who would pick Red Vines... Red Vines all the way! 1. What's your name? - I go by Paradox online. 3. Favorite book or tv show? - Stargate Atlantis for tv show, and I can't choose a favorite book. 4. Twizzlers or Red Vines? - Twizzlers! 5. Do you love Rafa as much as I do? - Rafa? 9. Have you seen Jacob's abs? If so, what do you think? - I agree that he needs to pull up his pants, but he is hot! 4. Neither. Jeff LOVES Red Vines, though. 6. The tops of otter pop wrappers, dumb pedestrians, and medical school secondary application essays. 8. Yes, but not hard. 10. This was a wonderful break from editting medical school essays! Amen on #6, although the special Edward Valentine Heart Candies someone left on my porch will always hold a special place in my stomach. I think mostly because those candy hearts have congealed into a mass there. I digress... where were we? Oh yeah. Welcome to the blog. Don't let me scare you away. Ruth- is "The Middle of Nowhere" an actual city name? Because that would be cool. You can't go wrong with Bones and Agatha Christie, so kudos to you. And you and cousin K are wrong- you can't possibly know #5 for a surety. Well darn it, I probably won't have "a chance to win a free book" because technically it's tomorrow. However, since I haven't been to bed yet it's still today for me. I work swing shift which is why I'm still up. So, I'm one of the lurkers I guess that you're trying to out. My name is Karen and I live in Pleasant View, Utah. You and I are second cousins. My mom is Suzanne Miller. I have not read a book for a long time, but I do listen to a lot of books on tape at work. I really enjoyed the "Work and the Glory" series. I haven't read (or listened to) a lot of the books you have mentioned on your blog. So I will be looking for those at my local library. As for favorite tv show, I really like "The Office". I like Red Vines, and Chocolate Twizzlers. My Grandma Tuttle (your Auntie Ferd) always had Callard & Bowser black licorice toffee at her house. I wish I could find those again. Sorry to say I also didn't know who Rafa was until I started reading your blog. I obviously need to pay more attention to tennis. My thing that must go would be the gray halo around my face. I look so old when I pull my hair back. I think my first kiss was in the ninth grade on Valentines Day. It was very sweet. I haven't slapped anyone across the face, but I do like to smack my hubbies bald head when I need to get some frustration out. Luckily he's a good sport and doesn't smack me back. I just checked out the picture of Jacob's abs and that is very hot. He does need to pull those pants up a bit, becuase I have teenage girls that are going to see that. It's okay for me, but not for them. I've probably shared way too much at this point so I probably don't need to do number 10. Thanks for letting me be a lurker. I really enjoy reading your blog and getting your twitters. Karen- welcome! It's never too late to enter the contest. Well, when Wednesday's blog goes up, then it will be too late. But you are definitely entered in the contest. I remember Auntie Ferd's black licorice. It seems like every grandparent from that generation enjoyed their specialty black licorice, doesn't it? Oh Spike! 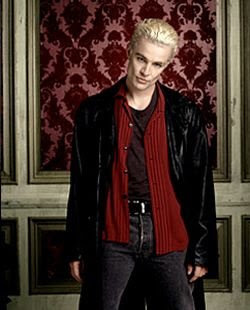 I went through such a Buffy phase; and Spike was definitely he vamp of my choice. I loved it when he was pinning.... where was I? I am a red vines girl, but Mike is a twizzlers boy. We still make the marriage work. I'm happy you and Mike have learned to live with your fundamental differences as to tastes in licorice. 4. Twizzlers or Red Vines? Red Vines!!!! 5. Do you love Rafa as much as I do? umm no. 7. Age of first kiss: 11????? 8. Have you ever slapped someone in the face? Yes I have. In 7th grade. He was making fun of me and I'd had enough. I'm amazed, I am not a black licorice fan (I even dislike anise as a seasoning). My father LOVES black licorice as does my hubby. I've always wondered what the attraction is. Jill- welcome to the blog! Kudos on #8 and #10. Well done. Una- I have discovered some people are very attached to their black licorice. I do admit a hankering for Good 'N Plenty now and then. 4. When I could eat wheat, Twizzler! 5. Sadly, no but then I'm a swimmer so I tend to watch the swimmers instead of the tennis. 7. 17 1/2; was at a party at the neighbors across the street from my parents' house. Could see my mom in the kitchen window the entire time! 9. I'm not a big fan of Jacob, nor his abs. I still fight his casting and get irritated thinking i have to watch him in the next movie. 5. I'm starting to thanks to you! 9. I had to switch sides after seeing that picture. The book and movie are very separate for me so I can feel ok about switching camps. Secret J- welcome. I've been waiting for you to comment. I agree- Mick St. John- it's like we hardly knew him. Debbie- Yes- I've heard of Shiver. It's supposedly going to be huge. Do you like it? Where did you get a copy? You'll have to send me an email and let me know what you think! 1. My name is Hannah, or Hannah Banana, or Hannah Felula, or Betsy, or Cabbage. Don't ask. 2. I live in Utah. 3. Favorite book: Frannie in Pieces by Delia Ephron. 4. I am a Twizzlers fan. 6. Thing that must go: Laundry. Mine has been piled up in my room since 3 weeks ago. Yuck. 7. Hasn't happened yet. I'm 13. 8. Yep. I won't go into details. 9. Yep I have seen them. Wow. But I think he should pull up his pants just a bit. 6. Thing that must go: the broken tv right in the middle of the floor of my front room. 9. Have you seen Jacob's abs? I see them every night. I think they're awesome! What are ya'll doin' lookin' at my hubby's abs?!?! 10. Yes I have also seen taylor lautner's abs, and too think he should pull up his pants. All you ladies should be happy to hear that the picture in question is actually a fan-made manipulation - i.e., that is not Jacob's bod! His is even better, and the pants are definitely always at a more appropriate level; the actor is only 17 after all, and a very innocent & humble 17-year old at that. Hannah- welcome! Officially the cutest answers to #7 and #10. Thanks for introducing yourself. Alissa- you're the only person brave enough to admit to liking Rafa as much as I do... and I would believe it! Alysa- Of course, now I have to ask for a picture of "Jacob's abs..." And did you slap your sister as an adult, or as kids? 5. Do you love Rafa as much as I do? No. Does anyone? 7. Age of first kiss: 10? 9. Have you seen Jacob's abs? Hell yeah. Also, I'm a huge fan of Angel and Spike. 4. Twizzlers or Red Vines? Red Vines. 5. Do you love Rafa as much as I do? Rafa, as in the king of hotness? I don't know that it's possible to love him more than you. 8. Have you ever slapped someone in the face? Yes, and it didn't make me feel good. And that made me mad. 9. Have you seen Jacob's abs? If so, what do you think? Bree thinks he needs to pull up his pants. Yes, I've seen them. But really, isn't the question have you seen his lovely, long, totally natural looking hair?! Barf. I've been thinking about that list of craziness you learned at the Writer's Retreat ... and a lot of those are me. How did I sneak in as least crazy? Maybe we're just all the same kind of crazy. I know I am too late for the book contest, but here goes anyway. 3. I almost never watch TV, the last show I really liked was Eli Stone. Glee looks pretty good from the first episode. There are so many books that I love - all time favorite is probably The Bronze Bow. I re-read it every few years, and To Kill a Mockingbird. 5. He is pretty cute, but all I know about him is from your blog. 6. All the boxes and piles of crap at my house. 7. 13 I think. It was in the field behind my house and it was slobbery and gross. First good kiss was when I was 16. 8. My teenage daughter when she was being a mouthy brat. She was shocked, and so was I. 9. Yes. Can't wait for the movie. 10. I can't think of anything... I guess I am boring.